The Bembe people migrated from Congo in the 18th Century and resettled in the eastern part of the forest in the Democratic Republic of Congo, near the border with Tanzania and Burundi. 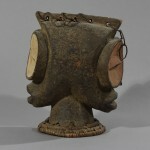 The “cult of the ancestors” is an important part of the Bembe social and spiritual life. They are a tough and proud people who carved out their current homeland in a time of widespread conflict and under economic pressure from European invaders and slave traders from Tanzania. Moreover, they worship private and public shrines, often food is offered or animals are sacrificed, in exchange the ancestor protects the tribe. Thus ancestor figures are rare and appear only in the south-western territory. 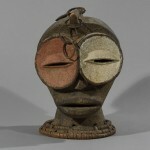 Bembe artistic production is mostly limited to masks. 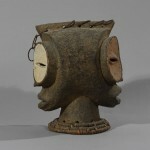 There are two types of Bembe mask, the most famous Echawokaba, belongs to the secret society and is a Janus face helmet. 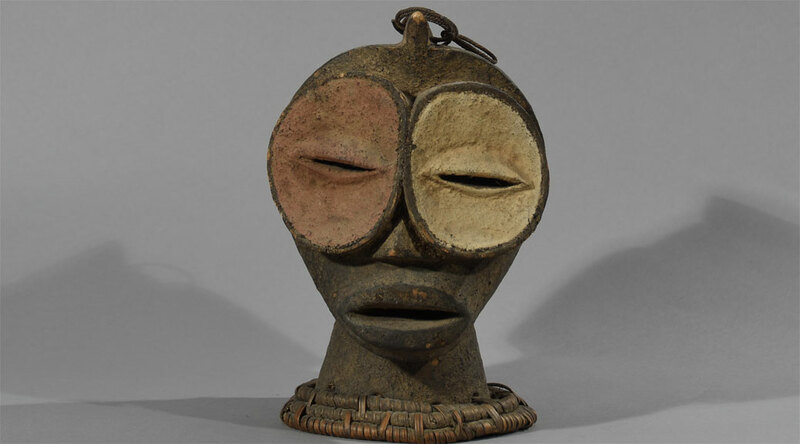 It represents a spirit from the forest and is used during initiation ceremonies. 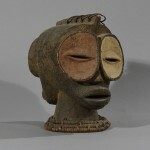 In the secret Bwami society circumcision ceremonies, flat masks, with typically enlarged concave orbits and bulging coffee-bean eyes are worn. Medium: Wood sculpture, with rings in ‘hair withers’. Mounted on a raffia braided centerpiece. Dimensions: H: 25,5 cm. W: 17 cm, D: 21 cm. Age: Est. beg.-mid. 20th Century. Provenience: Bought from Paris gallery by Danish painter who lived in Paris in the 1960s.